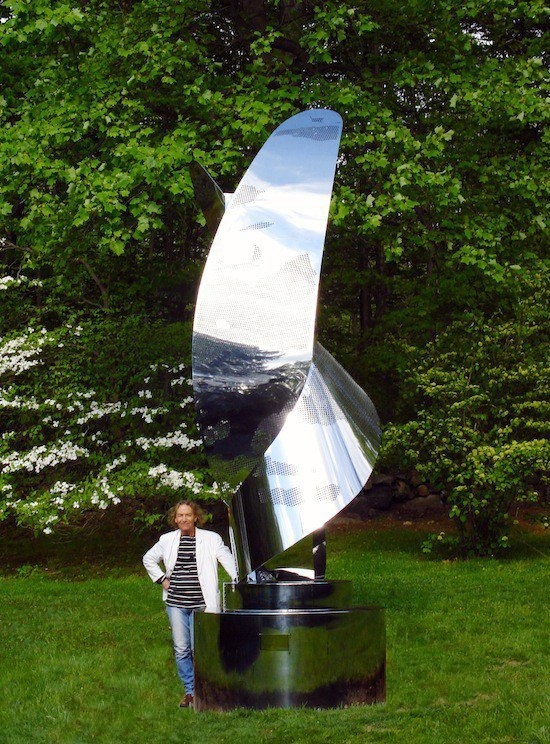 This monumental outdoor sculpture was fabricated in the U.K. and installed In the USA, NY State, May 2013. 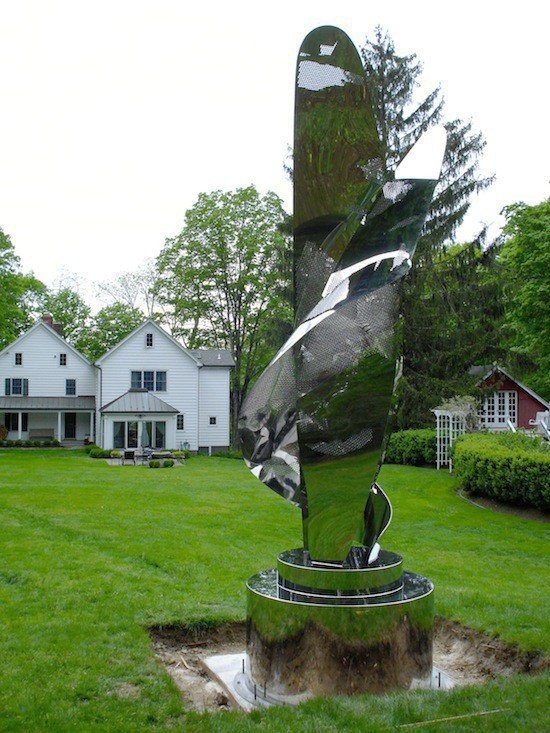 This garden sculpture is a multi-facetted three-dimensional portrait using three aspects from a single face. 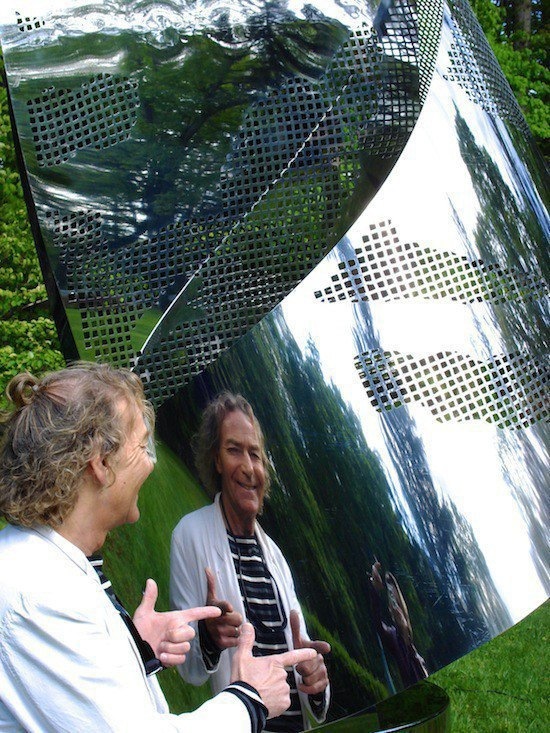 The laser-cut portrait image itself is partial, not a full portrait and is conceived to allow only a glimpse of the essential character contained within the three sculptural elements which comprise the composition. 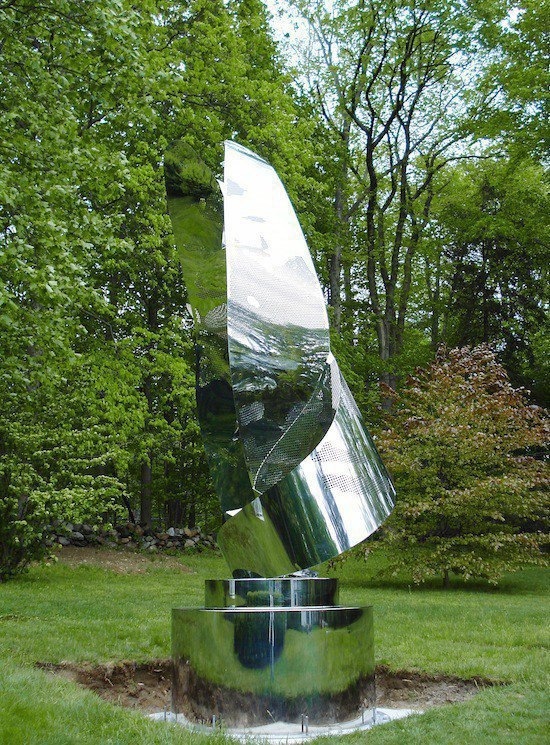 The result is superbly abstract. 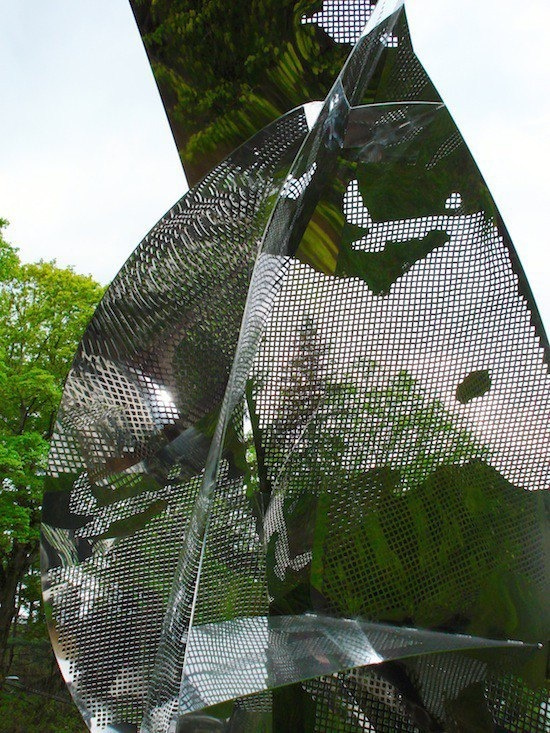 The mirror-polished stainless steel used for this artwork adds yet another dynamic level to the fascinating and extraordinary balance of solidity and transparency whereby reflection is utilised as an important new feature for the sculpture itself. 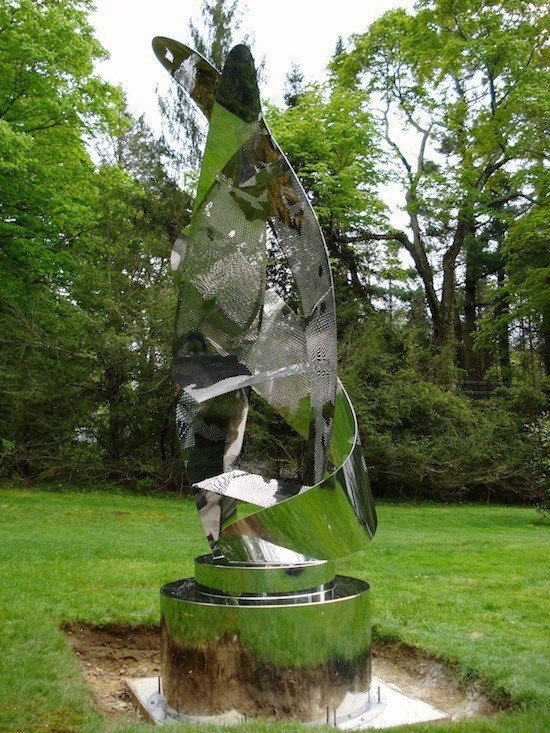 On a formal abstract level the composition centres around a dynamic interplay of positive, negative and reflection as well as being an actual portrait. The associations and references the artwork conjures up is surprisingly expansive. 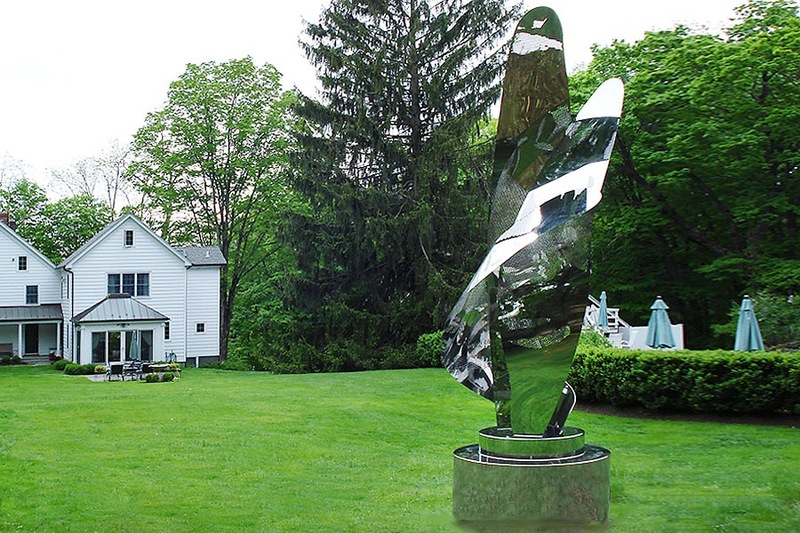 The immediate impression is that of leaves or blades of grass rising enigmatically out of the ground. 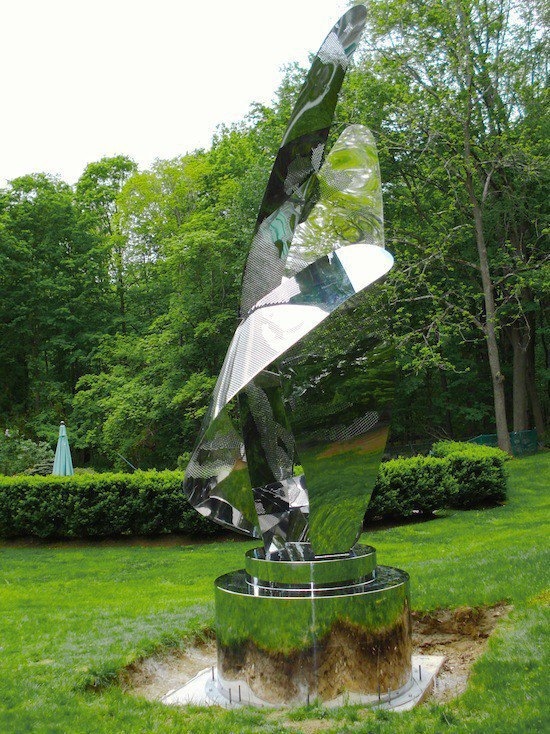 Its three elements also have the power to evoke a primitive or tribal quality as the ambiguous shapes flex in an optical struggle between being shield, feather, flame or blade. 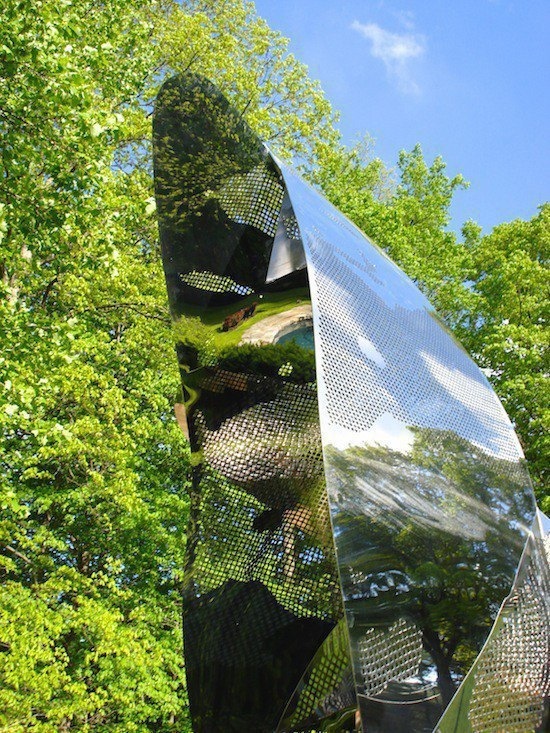 Having arrived at flat, almost two-dimensional sculpture in response to the exquisite shadow produced from any one of his 3D steel-mesh sculptures, he has now moved spectacularly forward to create sculpture using flat panel components which he articulates in three-dimensional space. 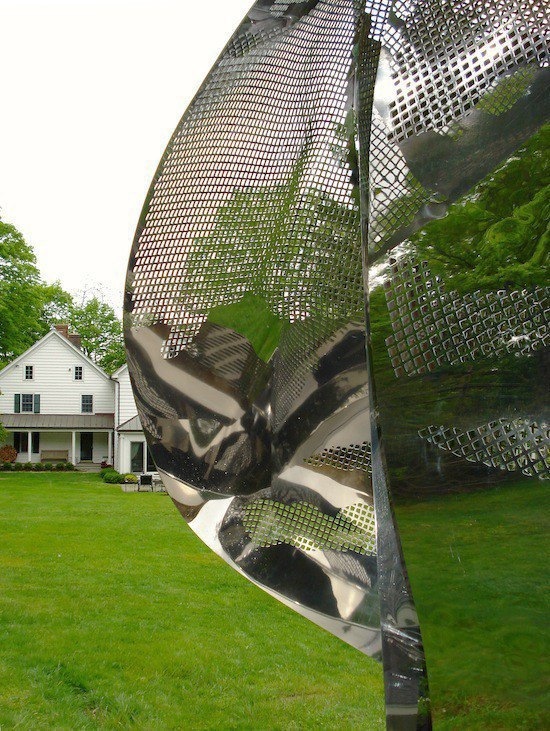 The sophisticated flat panels contain the essence of his unique three-dimensional mesh sculptures from which the images for his steel-panel artworks originate. 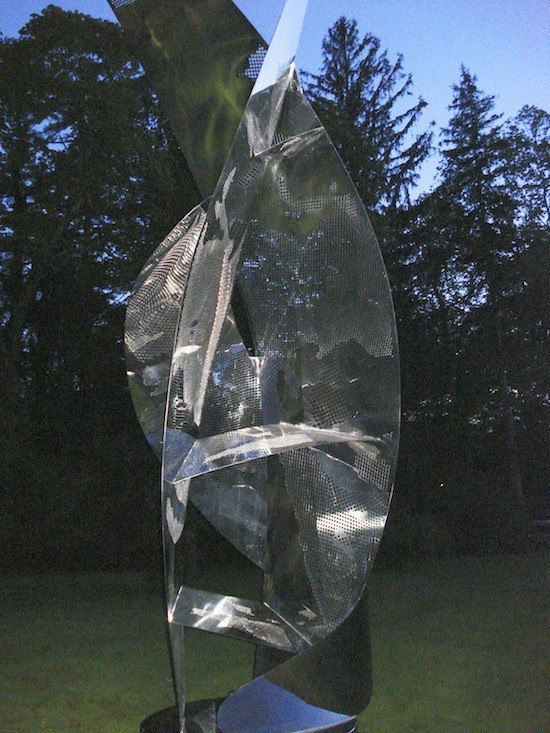 The strategic shadow image which was previously included compositionally as a projection on the wall behind his sculpture is now incorporated into the sculpture itself. Other associations include surfboard, sail or aeroplane wing. 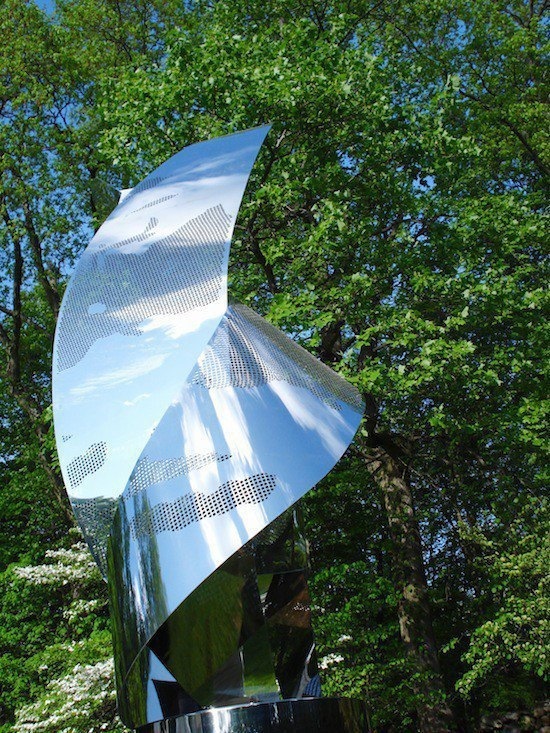 The dazzling surfaces of the sculpture reflect and fragment the immediate environment and the volatile mirrored shapes suggest solar panel or satellite and on a subliminal level its predominant shape is reminiscent of a crescent moon. 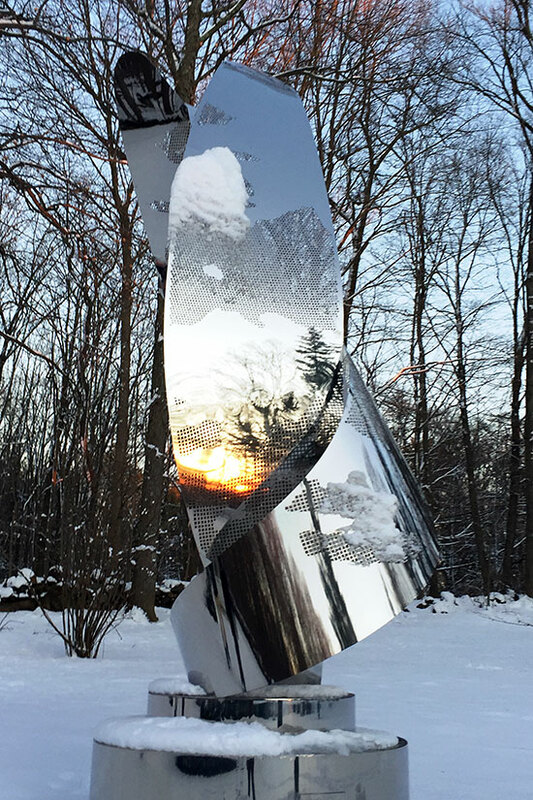 This sculpture at first seems to be a radical new departure for the artist, but is in fact a natural development from David Begbie's current work using flat steel-panel and photo-technology, a new and original art-form which David developed and has been exploring in recent years. 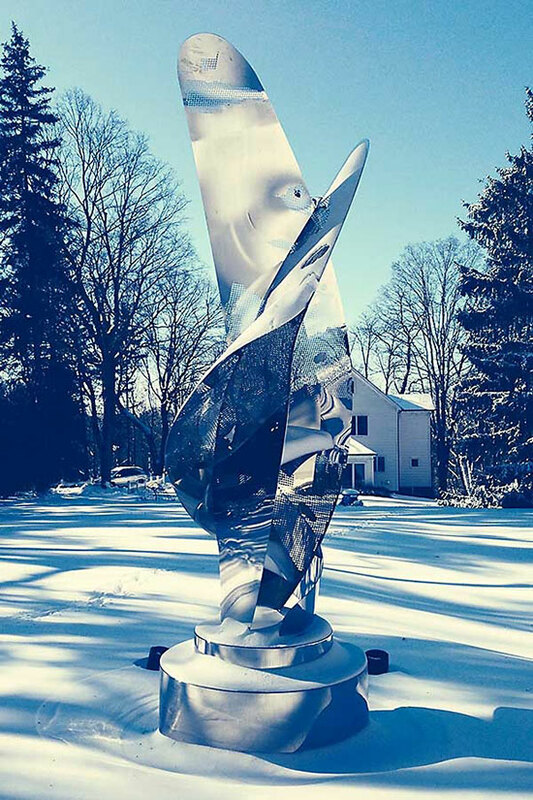 "… a dancing embrace gently holding masculine and feminine in a perpetual balance…"